Mrs. Usoro holds a BSc in Sociology from the University of Calabar, an LLB from the University of Buckingham, B.L from the Nigerian Law School and an LL.M from University College London. She was the pioneer Director-General and Chief Executive Officer of Nigerian Maritime Administration and Safety Agency, NIMASA from August 2006 to May 2007. She is the Managing Partner of Paul Usoro & Co., a leading law firm in Nigeria. 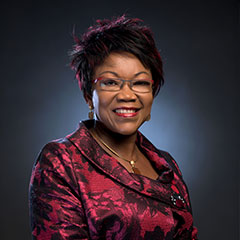 Mrs. Usoro has served on a number of presidential and ministerial committees and was chairperson of the ministerial sub-committee of the Maritime Organisation of West and Central Africa (MOWCA) regional Maritime development bank in 2009. She is the recipient of several national and international honours and was conferred with the Officier de L’Ord de Mono, a national honour of the Republic of Togo in 2002.